I’m not that old (I keep telling myself), but I do like to look at the current food scene in perspective. Food culture has come a long way the last 20 years. Minimalist decor, wild flavour pairings and cutting edge cooking methods are, if not the norm, considered commonplace. Brno may have some catching up to do (it will never have the edginess of a NY, Berlin or Melbourne), but its making strides. Opening the door to Il Mercato transports you back in time 20 years. It is a stark reminder of just how far we’ve come. Il Mercato hearkens back to the days where pretentiousness and exclusiveness trumped flavor and pleasure. 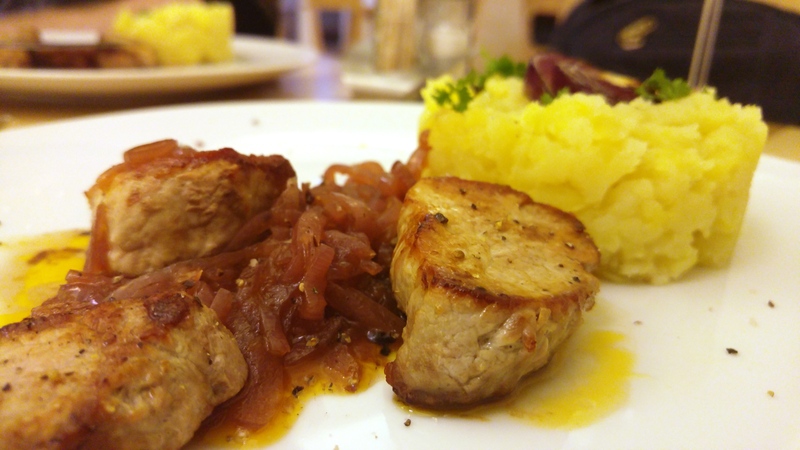 I visited Il Mercato my first year in Brno and vowed never to return. I heard they switched to a more relaxed bistro style while construction is going on there, so I figured I’d give it a try. Another item to put on my life’s regrets list. If the stuffy atmosphere doesn’t have you searching for the exits, the menu should have you running for the hills. The amuse bouche of tuna and pizza sauce tickled my palate and raised my eyebrows a bit. Maybe this won’t be torture after all. But then I look at their menu. In their defense, they did drop their prices a bit for their “bistro” menu. I suggest they keep the prices where they were and invest that extra cash on some flavor. On their whole menu, there was one dish that didn’t bore me to death; the lamb sweetbread appetizer. 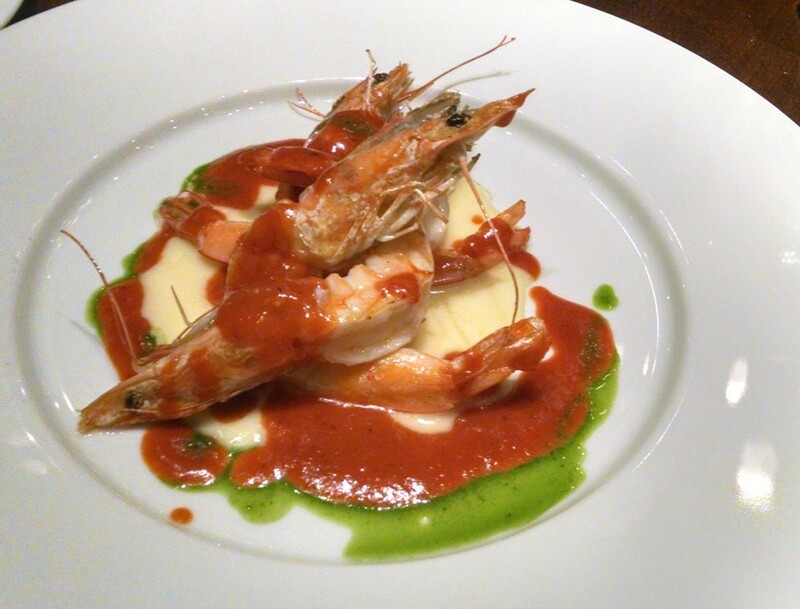 Unfortunately, I made the mistake of heeding the host’s advice and went with the prawn appetizer. After all, I love prawns. How can I be disappointed with prawns? By ordering them at Il Mercato, that’s how. Their first attempt was undercooked. I’m a huge fan of raw seafood, but I don’t think the prawns were supposed to be translucent in this dish. Their second attempt, bland as it may be, was at least cooked. While the parmesan cream added a bit of flavour, the roasted red pepper cream tasted like water. There was no spice at all to cut the sharp flavour of the parmesan. I have never had such a bland plate of seafood in my life. The hits kept coming. 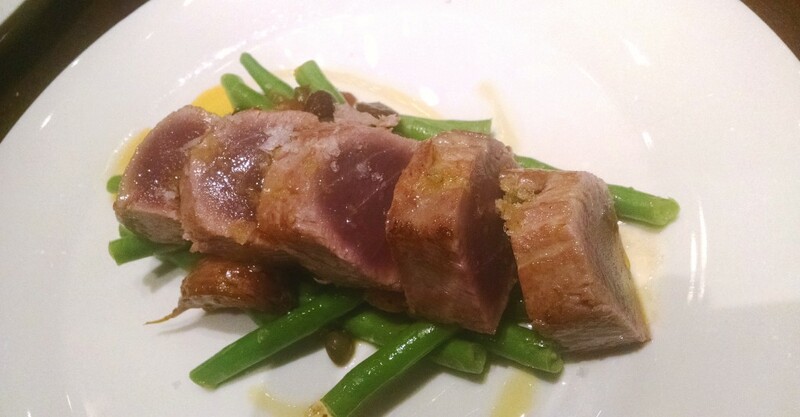 Per the host’s recommendation, I went with the seared tuna. They tried their trick of giving you a great free taste between courses (this time it was a lemon sorbet), but I wasn’t fooled this time. I would have been better off getting a kebab around the corner. Don’t get me wrong, the tuna was good. It was cooked perfectly (seared and raw). But the dish had less thought put into it than a hot dog roll. It came on a bed of string beans that were painstakingly woven into a fancy pattern. If only they had thought about putting something sweet or creamy on the plate to balance the bitterness of the beans. The taste was so sharp in contrast to the tuna, my mouth forgot the tuna was there. I got out of there as soon as I could. An appetizer and main dish set me back 800 CZK without any drinks or desserts. I feel dirty having supported such a terrible establishment. I hope they use some of that money to invest in some taste buds for their chefs. It’s true that I don’t like formal dining, but they could at least attempt to have some decent food to go along with their stuffiness. Even if you prefer formal dining, spend your money somewhere that cares about the formal and the dining.